Located in a beautiful site near the river on the banks of the Mekong and opposite to Wat Xieng Thong, Wat Long Khun (or Long Khoun) is known as the Monastery of the Happy or Blessed Song. Sometimes it is called as the Monastery of the Willow Stream that you should visit in Laos tours. The monastery had existed for a long time and had significant ties to the Luang Prabang royal family. Served as a retreat center for spiritual revitalization, the monastery was a place for traditional practice. The King, who would be designated as a new head leader of the country spending three – day practice of ceremonial bathing and meditative retreat on the eve before his formal coronation at Wat Xieng Thong. 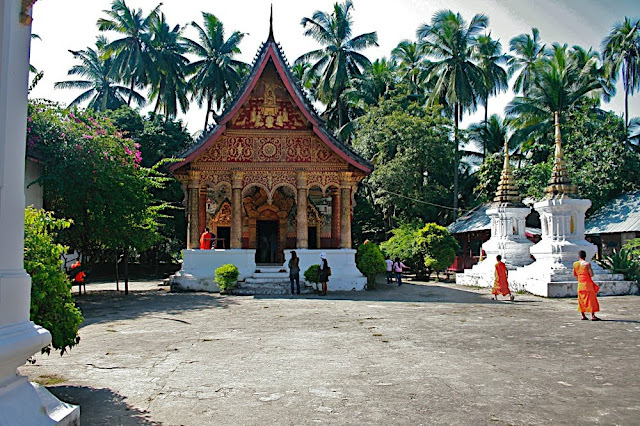 Wat Long Khoun is a typical example of Luang Prabang architecture in the 18th century featuring with two single level sections. However, under the instruction of the then-reigning King Sisavonvang, the front part was extended in 1937 and sophisticatedly redecorated with gilded columns and exquisite wood sculptures. Inside the older part, there are Jataka murals, which depict lively the 547 lives of Lord Buddha. These murals contain the local myths and legends as well as express Buddhist morals such as kindness and the importance of giving. However, due to revolutionary vandalism in the 1970s and adverse conditions of weather are the causes of some damages to these murals. Along with the dissolution of the monarchy, the temple was also neglected and abandoned in the disrepair state. Thus the work of renovating the temple was much needed. 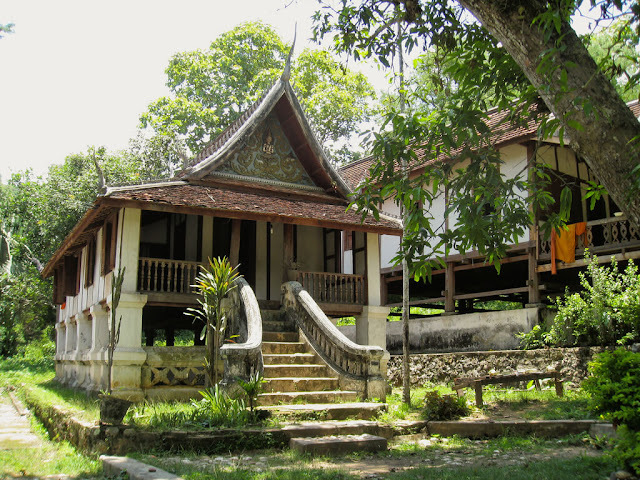 The Lao Department of Museums and Archeology and the Ecole Française d’Extrême Orient who were responsible for restoring the complex in the mid – 1990s. Traditional materials and techniques were used in the whole process. Traditional wooden outhouse as the living quarters for monks and the original meditation room used by Kings in the past, which are nowadays still well – preserved. The temple is decorated with two large bearded Chinese statues flanking under the portico as the guardians at the main entrance and eight black-and-gold columns topped with lotus petal designs of entire porch. 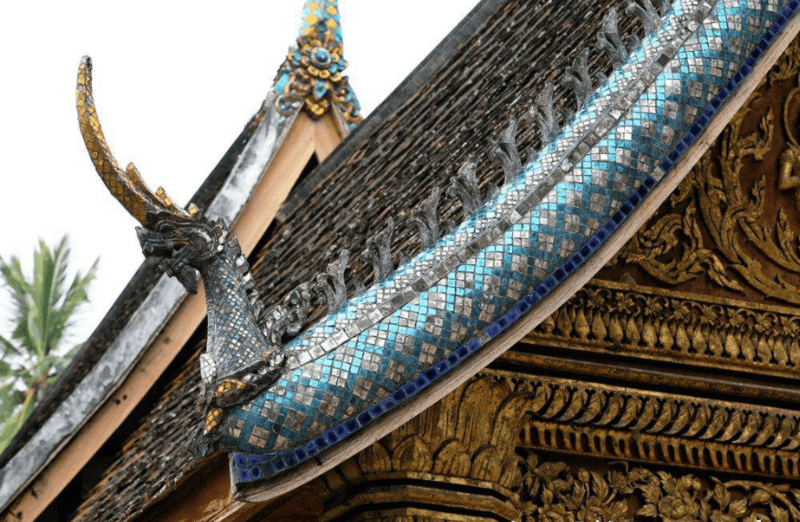 Besides, when coming inside the temple, you will see many impressive statues, carvings, and decorative deities such as a red ceiling with dharma wheels, peacocks, and mythical creatures intricately stenciled on. How to get to Wat Long Khoun: You can get to the temple by hiring a boat with the price of $2. • You should give a respectful silence when visiting the temple. • Wear formal clothing and make sure take off your footwear, sunglasses before entering. As one of the typical temples in Luang Prabang, Wat Long Khoun is really a worth place for visiting in your journey of Luang Prabang Travel. Coming to the temple, you will have a great opportunity to have deep understanding about long lasting history and culture of Laos, the Kingdom of million elephants. Indeed, it is just one of the best things to do in Luang Prabang, the ancient town that you should try to make your journey more exciting.